Apple: Icon, Icahn or iGone? - Dohmen Capital Research, Inc. Remember, market tops are made when everything looks best, not when they are bad. Currently the big hedge funds have significant positions in the stock. On Nov. 20, several Wall Street firms increased their price targets for the stock. More upgrades came around Thanksgiving Day. Wall Street firms are trying to outbid each other as to who has the highest target price. On Dec. 1, Barclays upped its price target for Apple from $120 to $140. And on Dec. 3, JMP Securities raised its target to $150. We have now reached the “giddy” stage in this stock. This is the typical “peak euphoria” seen by popular stocks at a peak. The company has been doing big stock buybacks this quarter, which is a form of financial engineering, not product engineering. Some of Apple’s products, like the iPad, could really use some of the latter. Now I look at my technical indicators for signs of the “distribution” phase. That’s when the big guys, like hedge funds, start unloading stock into a rising market. They cannot sell large quantities when a stock is declining. The start of that may have occurred on Dec. 1. About 20 minutes after the market opened, Apple’s share price plunged about 6% in a short time before erasing some of the loss by the close. There was a volume spike of 6.7 million shares. This is typically how big holders of a stock get out. Recently, hedge fund ace Carl Icahn owned more than 53 million shares of Apple. He has been sending messages to Apple’s Tim Cook, via CNBC, to do a big $100 billion stock buyback. That would be a way for Icahn to get out of the stock with a huge profit. How else can he sell that many shares without driving the stock price down? And there are other big hedge fund managers with large positions as well. None of them want to be the last ones getting out of a big position. Will the big Apple investors be gone in 2015? The big hedge fund guys are smart. They may be asking the same questions I ask. Apple iPhone sales are supposedly terrific. But looking at third quarter iPhone sales, they have lost over 3% market share versus the same time last year. For an investor “market share” is very important. Market share for other Apple products has been declining for several years. That means the competition is gaining. I know that for the Apple-philes, saying anything negative about Apple is like attacking the Pope. For an investor it’s important to note that there is a big difference between a company, its products, and its stock price. As an investor, I may like the products, but I may consider the stock too risky. Most people loved Blackberry, and still do. But then, the iPhone came out a revolutionized the cell phone market. Blackberry stock plunged from $148 to $6. Some analysts even thought it might not survive, until the company hired John Chen as the new CEO. Let’s look at the positives for Apple from now until year-end. Christmas sales boost: Apple sales will be excellent. IPhone users had waited a long time to get the bigger phones the competition had offered for two years or more. Now they have it. If sales disappoint, they always have the excuse that they couldn’t produce iPhones fast enough. IPad users may buy a new iPad, although there is not that much reason to switch from the older models. But some people always want the newest. The stock price has done very well since the bottom in April of 2013. The plunge from 2012-2013 is already forgotten by most. Six days after Apple had hit its high of $705 (pre-split) on Sept. 21, 2012, I said the stock was a ‘sell’ and the stock price would plunge. It did! In April 2013, I said on CNBC that I wouldn’t buy it until the stock price had a “3 in front of it.” That happened on April 19, 2013 when the stock hit a low of $385 (pre-split). From there the stock started moving up, slowly. Then Carl Icahn had dinner with Tim Cook, CEO of Apple on Sept. 31, 2013. Thereafter, I said that Icahn probably taught Cook about “financial engineering.” The stock started moving up more. Then Apple announced a “financial engineering” package: an unusually big stock split of 7 to 1, another enormous stock buyback bringing the total to a record $130 billion, and a dividend hike. Yes, Icahn is a good teacher. The biggest stock buybacks in the US markets are always between Nov. 1 and year-end. That’s great for the stock market and for the stocks involved. Apple’s total announced buybacks have been $130 billion, an incredible amount. The stock price gained more than 20% in the 6 weeks following Oct. 15, helped by the buybacks. What happens when the buybacks stop or slow at the end of December? The biggest hedge funds own large positions in Apple stock. My rule: when everyone is in, avoid! When all the potential buyers are in, what buying power is left to drive a stock higher, except for buybacks? Let’s shed some light on some of the negatives for Apple’s stock in the coming year. MARKET SHARE: Apple is losing market share in the US. That’s the warning. In Q3, iPhone’s US market share dropped to a recent low of 30.1% in Aug. 2014 from around 40% the prior year, according to analytics from the Kantar Group, a top mobile market research firm. Shortly thereafter, the iPhone 6 was launched and sales boosted market share above 40% once again. But that was the typical new product bump. Sales in Europe and Japan are lackluster. In Japan, market share dropped a big 15.9%. Those consumers look more at value rather than the “eco-system.” IPhone 6 sales are fueled by “catch-up” because Apple was about 2 years behind the competition in offering larger phones. That will be a driving force into the holidays. Once that demand is exhausted, what’s left? China is the “great hope” for Apple bulls. But competition from Chinese firms is stiff, with much lower priced smart phones, especially from Xiaomi. The iPhone is a vanity item in China with limited affordability, at a time when luxury sales in China are down 40%. 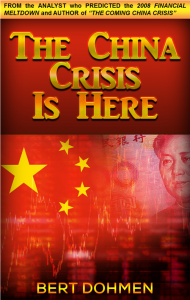 China is now in a monumental credit crunch. The 7.3% GDP growth is pure fiction. Chinese and European economies are in trouble. When consumers reduce spending, a $900 Apple phone (remember, no subsidies outside of the US for the iPhone) is low on the shopping list. Apple believes that its logo alone is worth a 100% higher price than the competition. Users are starting to disagree because of the great alternatives. The major problem in the smart phone market, which will affect all the companies in this field, is the increasing competition producing profit margin pressures. Apple’s game plan apparently is not to compete on basis of price, much like a Rolls Royce. But how long will it take before more and more iPhone customers realize that the smart phone is becoming ‘commoditized,’ just as the personal computer was about 20 years ago. Then the Apple eco-system will start to crumble. Samsung is not sleeping. The Galaxy S6 is expected in 2015. Samsung knows it will have to offer some big advances to fight the iPhone competition. Samsung is not tied to the belief that its logo should demand a 100% higher price. International Data Corporation (IDC) expects global smartphones to have an average selling price (ASP) of US$297 worldwide in 2014, dropping to US$241 by 2018. IDC expects prices in emerging markets like India to decline from the current US$135 to US$102 by 2018. Compare that to the iPhone at over $900! IDC expects that by 2018, Android will control 80% of global smartphones shipped and 61% of revenues, while iOS will control only 13% of volumes and 34% of revenues. That means a drop in market share for both. This is the typical evolution of great ideas with high profit margins: they attract competition. 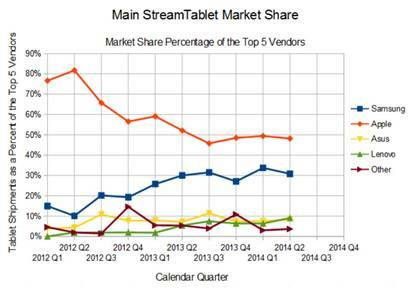 Below is the chart of the tablet market from IDC. Note the red line, Apple’s iPad, has declined over the past two years while Samsung (the blue line) has risen strongly. Note: this chart doesn’t include the surge after the release of iPhone 6. Of course, the optimists believe that the iPhone 6 will reverse the trend for the long term. In my opinion, the bump is temporary. Asking people to pay $200 for extra memory which Galaxy owners can buy for $25-$35 from third parties will entice more knowledgeable people to question the value proposition of the iPhone. APPLE WATCH: Now the great hope of the bulls is the Apple Watch. The bulls hitch their hopes on this gadget. I predict the Apple Watch will be a big disappointment. Even if the Apple Watch has 100% market share in that sector, which is unlikely because the competition like Samsung have a big head-start, it might only be about 5% of total Apple sales. In fact, I believe sales will be less than half of what analysts estimate. So far, the watch is “a work in progress.” It’s not yet out. Young people don’t wear watches because their phones have the time. Older guys wear a watch as jewelry, and this product doesn’t qualify for that. 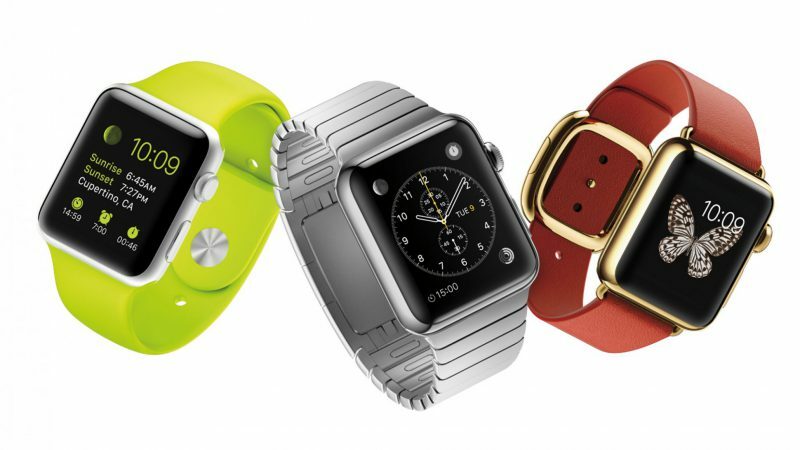 I ask, would you pay $350 for the Apple Watch when you have a smart phone in your pocket? 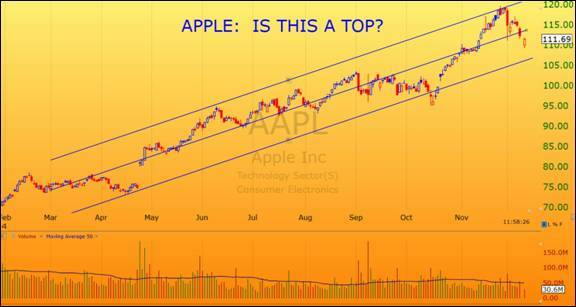 THE CHART: Finally, I present the chart of Apple, including the stock’s volume (bottom). Our advanced technical analysis gives us some important clues. You can read our interpretation in the next issue of the Wellington Letter. BOTTOM LINE: Apple’s past success was based on developing great new products giving them a virtual monopoly for several years, such as smart phones and iPods. Since then, competition has virtually destroyed the sales of the vastly overprice iPod. Now iPad sales are being destroyed because of the competition. Could these be the future of the overpriced iPhone? US consumers get iPhones subsidized by the telecom companies. Therefore, they don’t notice the high price. But world-wide, consumers pay the true price. Currently, competition for smart phones is coming from everywhere. Competition kills monopolistic pricing, market share, profit margins, and eco-systems. Where is the next great thing? In my opinion, the big, but overlooked Apple jewel is in the computers. Apple computer sales just posted a record market share of 13.4% (without iPad sales). The Apple operating system is the best. That’s where the firm still has a big edge. Apple has always refused to license it to others because it has a superb profit margin on the computers. I feel that licensing should be re-examined. It could be a big revenue center. The fiasco of Microsoft’s Windows 8 gave Apple a great opportunity, but they let it pass by. Without exciting new products, instead of small, unimaginative changes, the only savior for investors is financial engineering, i.e. stock buybacks. Theoretically, Apple could probably borrow enough money to buy up half of its own outstanding stock. Earnings per share would soar, but total earnings wouldn’t rise. Perhaps that’s the plan. This is IBM’s financial engineering model. Look what IBM’s stock price has done the past six years: the stock has gone from $139 in 1999 to $161 now, for an anemic total $22 gain in 15 years. Stock buybacks only raise the earnings per share, but not total earnings. It’s deception. The companies borrow the money to buy the stock. How does that enhance value? One bull recently said on financial TV that he buys the stock because Apple “is returning money to shareholders via buybacks.” That’s weird. You buy a stock because the company buys it back from you?! As an investor, I prefer true engineering to financial engineering. The bottom line for my article is not whether Apple’s products are great, but whether the stock will be a great investment over the long term. The products will probably continue to be excellent, but not leaders in innovation. However, Apple’s stock price will have serious challenges. Apple’s products have significant and growing competition. Apple’s stock has even more competition from companies which are smaller, can grow faster, and can have some great innovative technology.